WHY DID ALLAH SWT ALLOW IT TO HAPPEN TO THIS UMMAH? WHAT IS GOING ON WITH US—THE NATION OF MUHAMMED SAW? Companions of the Prophet SAW inquired if this verse was only for him to which He SAW told them it was for him and everyone who meets the condition of the verse. 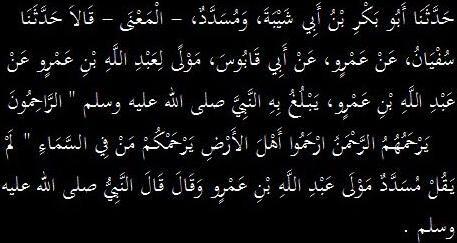 We, as a nation, are too far away from Allah SWT. Our hearts are full of duniya (material world) and we have forgotten the purpose of our existence! This material world is a testing ground. We are not here to indulge in its pleasures, or to accumulate money and build grand houses. 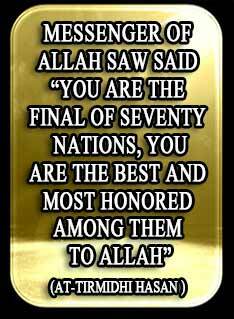 We, Muslims, have been honored by Allah SWT as the highest creation and the best of all nations! Throughout history, Allah SWT sent messengers and prophets to guide their communities to know the Creator, believe in Him and worship Him, except only one Messenger and one nation—that’s us! Allah SWT sent Muhammed SAW as a Messenger to mankind and chose his nation to convey the message to humanity after him…an honor that has not been granted to any community before. I was given what no other Prophet before me was given. Allah SWT has chosen us to be the best of the nations for a reason. We have been bestowed with the honor of carrying out the job of Messengers and Prophets, which is to spread the message of Allah to humanity. By this way, this honor comes with a condition! If we fulfill the condition, we get the honor and the promise of Allah SWT! If Muslims are the most honored in the eyes of Allah SWT, then why are we so disgraced and humiliated in the world? Today Muslims are surrounded by calamities and trials from all fronts. All that we see happening to us has already been explained by the Prophet SAW as well as its reasoning. We are in a state of humiliation and disgrace because we have forgotten who we are! We have forgotten our duty as the carriers of this message! Today Islam has shrunk to rituals and acts of worship. Muslims are content with their prayers, fasts, obligatory charity, and pilgrimage. We forget that these are just pillars over which we are supposed to build our lives. What is the use of pillars if there is no building constructed on them? Islam is much larger than that! It is a way of life according to the obedience of Allah and His Prophet SAW as mentioned in the opening verse of this article. Islam was revealed over a period of twenty three years; first thirteen years in Makkah and the last ten years in Medina. Anytime, anywhere in the world we want to revive the teachings of Islam, we have to go back to those twenty three years of revelations and discover where we stand. We have to place our lives as a society parallel to the period of revelation and determine where we fit in that time frame. Are we in Makkah or Medina? What part of Makkah or Medina are we in—beginning, middle, or the end? Once we determine this, we can take the Qur’an as it was revealed and implement the respective verses to our lives. This is not to say that the rest of the Qur’an is not important (astaghfirullah); Qur’an has been revealed in its entirety but at the moment, not all of it can be implemented on us as a nation. We will only be able to comprehend and implement it once we understand and follow the sunnah. Simply speaking, sunnah is a habit, custom and a way of doing things that never changes. Allah SWT has a sunnah. RasulAllah SAW has a sunnah. We all have a sunnah. 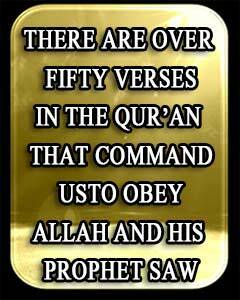 There are over fifty verses in the Qur’an that command us to obey Allah and His Prophet SAW. What’s more…Allah SWT has made it a condition of receiving His love! How can we obey someone we do not know? RasulAllah SAW is supposed to be our role model but how many of us really know him? How many of us know about his sunnah? What is his SAW’s sunnah? Is it the beard? The turban? The thobe? Two raka’h before and after the obligatory prayer? The highest of his sunnah is his manner and character! RasulAllah SAW had the ultimate love for Allah SWT and His deen. He sacrificed all he had for the propagation of this religion, and the first of these many sacrifices was his and his family’s comfort. He conformed his desires and opinions according to the will and teachings of Allah SWT. Where is this sunnah in our lives? The highest form of mercy for people is to free their souls from subjugation of others and allow them to taste the sweetness of faith in Allah. RasulAllah SAW always put his ummah and its welfare before himself and his own family. Even his dying words were the cries of ‘ummati ummati’ (my ummah, my ummah)! If we claim to follow the sunnah of the Prophet SAW, where is our concern for this ummah? What are we doing for its benefit and welfare? Where is our mercy towards humanity? If we believe that we have the truth, how come we are not willing to share it with others and save them from eternal torture? If we die tonight, what will we say to Allah regarding what we were concerned about? Today we are paralyzed as an ummah, facing onslaught from everywhere. Who put us in this state? Allah SWT! 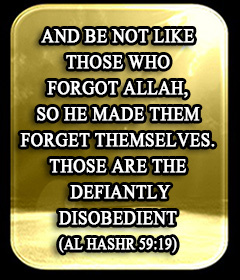 Those who forget Allah, Allah SWT makes them forget themselves! Our pious predecessors explained this to mean that those who forget Allah, He SWT makes them forget the door of guidance. And what can we do right without the guidance of Allah SWT?! Do we think that we will be left alone by Allah SWT and not questioned about our time in this world? We will stand in front of Allah and He will ask us about what we have done for this deen! Where is my commitment today? How much time do I devote to my spiritual development? How much time do I devote to d’awah to Islam? How much effort do I make for the betterment of the condition of the ummah? We have only the shell of Islam left and we are missing the fruit. The sweet fruit of iman, yaqeen and thiqa (trust in Allah)! 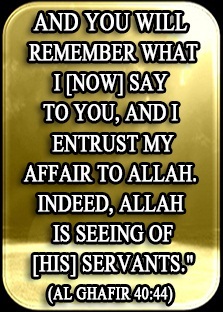 All our energies are focused on the acquisition of rizq (provision) and we forget what Allah SWT has commanded us to do. Allah SWT has taken the responsibility of everyone’s provision. Today we show Allah SWT our worst, and expect the best from Him! We talk about everyone except ourselves and our condition! Change! He will not change! We are not even aware of our condition, let alone willing to take action to change it! We are in such a deep state of heedlessness that we are not even aware about our heedlessness! Imam Malik RA counted the graves of the companions of the Prophet SAW in Medina and found a little over ten thousand graves. We know that during the last pilgrimage, Prophet SAW was accompanied by approximately one hundred and twenty five thousand of his companions. Where did the rest go? It is due to them that we have the dignity of Islam! It is because of their sacrifices that we have the blessing of la ilaha illal lah! 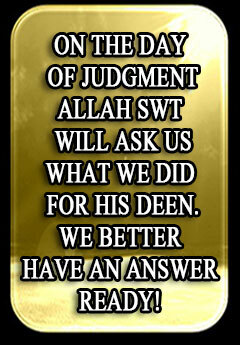 On the Day of Judgment Allah SWT will ask us what we did for His deen. We better have an answer ready! Our spiritual development is of utmost importance. We are willing to sacrifice all that we have to elevate the name of Allah SWT and to spread the message. At this time we will be ready to migrate to Medina and establish Islam in our societies. D’awah in Makkah started in the house of Al-Arqam Ibn Abi Al-Arqam (RA) and spread to other houses…house to house; and it has to follow the same pattern today. Everyone has to take the responsibility of spreading the message in their own capacities and be busy with the job that Allah SWT has assigned us. Our history is filled with dark shadows from which shining stars rose and dispelled the darkness with the light of their faith and conviction. One such story took place during the time when the Muslim nation was suffering the barbarity of Crusaders and Mongols. Battle of Ain Jalut took place on 3 September 1260 CE between Mongol army and Muslims. Muslim leader Qutuz’s wife was a soldier in the army who received a fatal blow while defending her husband from the enemy. On realizing that it was his wife who had laid her life for him, Amir Qutuz cried ‘O my wife’ She said, ‘don’t say O my wife; say wa Islama! Don’t think of me, think of Islam. I will meet you later in Jannah! This is the call we need today from pure faithful hearts! 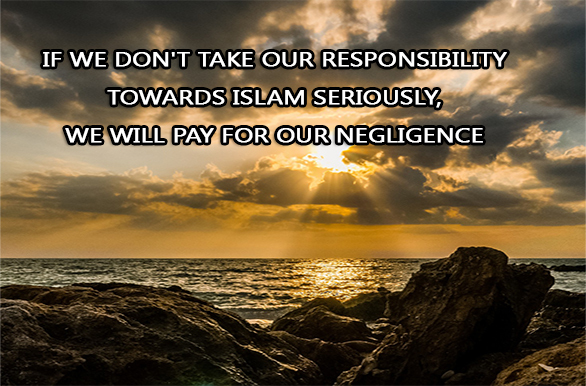 If we don’t take our responsibility towards Islam seriously, we will pay for our negligence—us and our progeny! Especially those Muslims who are living in non-Muslim majority countries. We have the example of Latin America in front of us where 99% of the migrant Muslim population lost their Islam by the third generation. This deen is rahma (mercy). We need to have rahma in our hearts for all mankind! Forget the ummah; do we have rahma on ourselves and our children? How will we save ourselves on the Day of Judgment from the wrath of Allah over our negligence? How can we expect victory from Allah when this ummah is suffering and we are sitting around watching? What can be higher mercy than to lead people to the oneness of Allah SWT and free their souls from constraints of this world? 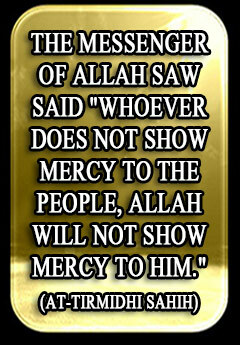 What can be more merciful than to save people from the eternal punishment of fire and put them on the path of jannah? What is going on with us if our worship and rituals are not benefitting our hearts and improving our manners? What is happening O Nation of Muhammed SAW? Unless we change what is within ourselves, we cannot change anything around us. We have to set our priorities and start with ourselves. The first area of focus is our hearts. We have to remove the stains of duniya from our hearts and embrace Islam as a way of life. Each one of us is responsible for this deen at his own capacity; and the first step of accepting this responsibility is setting the intention to devote our lives for the sake of Allah SWT and His religion. The sincerity of this intention will reflect in our actions and efforts to change ourselves and mould ourselves according to the teachings of Allah SWT and His Prophet SAW, and our obedience to them. The saying goes: the one who doesn’t have cannot give! Unless we have Islam in our hearts, lives, families and houses, we will never be able to invite others to it and thus fail at the mission that Allah SWT has chosen for us! Stay with us on this journey of seeking correct understanding. Read the rest of the articles in this series to determine where exactly we stand as individuals and as a nation and what measures we need to take in order to rectify our situation. This is a glimpse and a reminder of the purpose of our creation, our existence, and our message. Individual worship and rituals only benefit you as a person to strengthen your relationship with Allah the Almighty. By the time you finish reading this series of articles, you will discover how much we have forgotten our purpose and goal which is the most important part of our duty to ourselves, our family, our nation, and mankind. I ask Allah SWT to put barakah, noor and qubool in everything I say and I do and I beseech Allah SWT to make this a source of enlightenment and guidance for mankind.